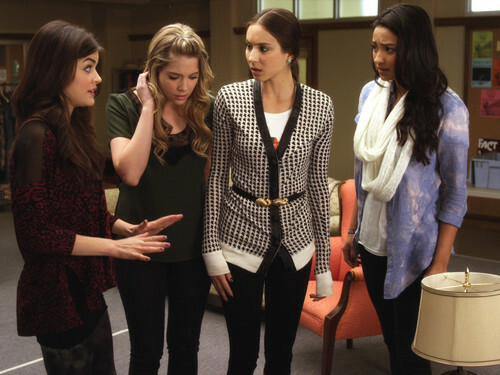 (L-R) Hanna, Emily, Spencer and Aria. So for those of you who watch Pretty Little Liars the title of my blog post will be all to familiar to you as it’s part of the incredibly catchy theme tune! For those of you who do not know I am a MASSIVE fan of Pretty Little Liars. My flatmate Becca introduced me to it a few weeks ago and I have been hooked ever since! For those of you who have never watched it I will give you the low down without giving too much away! The show is about a group of four female friends who receive anonymous texts from a omnipresent mysterious figure (or figures!!) only known to the girls as ‘A’ which start after their friend Alison goes missing and is later found dead. ‘A’ seems to be doing everything in their power to ruin the girls relationships with each other and other people in their lives while they spend their days trying to work out who ‘A’ is and stay out of trouble which never really goes to well! Not only is the story line incredibly gripping, but the outfits are to die for! These aren’t typical American high school outfits, the girls’ stylist Mandi Line seriously knows her stuff and each episode I find myself making mental notes to recreate all Aria’s outfits. Hanna is the girly girl of the group and she is always seen wearing flirty girly outfits and light colours, Aria is the odd ball of the group and wears grungy rock and roll skirts and dresses, Spencer is the preppy one and also the richest of the group so her style is a lot less daring and finally Emily is the sporty spice of the group and is mostly seen wearing trainers but she definitely knows how to rock them! So a couple of days ago a Halloween special episode was released but I don’ think season three properly resumes until January, so that’s plenty of time to get up to date if you haven’t watched the past seasons! How about you guys? What are your favourite TV shows at the minute or are you a Pretty Little Liars fanatic like me? Let me know! Psst my blog has a Facebook page now! Check it out here.